Since implementing GoSpotCheck, Alliance has effectively cut the amount of time needed to load information in half. Alliance Sales & Marketing is a full-service sales and marketing agency with a large, nationwide footprint. 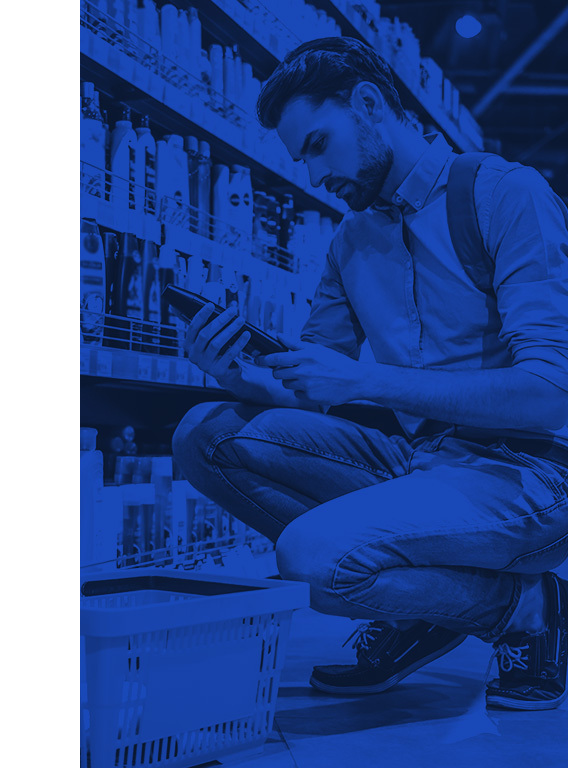 Alliance works with many big-name consumer packaged goods companies to optimize their retail merchandising practices and ultimately increase revenue. That means routinely analyzing in-store data and conditions to identify areas that can be streamlined and improved to drive business efficiency and sales figures. Alliance Sales & Marketing’s business model revolves around deep, data-based analysis and crafting impactful retail road maps and successful go-to-market strategies. Their work takes field teams all over the country visiting big box retailers, supermarkets, and specialty stores. Managing an operational footprint on that scale—while maintaining a granular view of displays, product shelves, and in-store conditions—is no easy feat. To achieve the high level of visibility needed to meet customer goals and showcase tangible ROI, Alliance stakeholders Maggie Ruper and Joe Adamsen knew a mobile execution management upgrade was necessary. Although Alliance Sales & Marketing’s field teams are stocked with some of the most skilled and experienced professionals in the industry, there was plenty of room for improvement when it came to workflows and internal processes. For instance, Alliance’s existing execution management model lacked any sophisticated image-capturing capabilities. This prevented frontline employees from quickly and efficiently documenting store conditions with complete accuracy. Many of Alliance’s field headaches stemmed from a reliance on a spreadsheet-based reporting system. The manual data entry and slower workflows involved in this process required a lot of tedious work to be completed in order to generate powerful reports for clients. Such bottlenecks stood in the way of Alliance stakeholders delivering in-depth market analysis reports in a timely, efficient fashion. Moreover, Alliance had employed an execution management app in the past, but found the results lacking. In particular, the program was extremely resource-intensive and ran very slowly when launched on a field agent’s Microsoft tablet. The app’s large size also created headaches for field teams who could not make room for other important files because of inadequate storage space. The app had shortcomings in other areas as well. It was not compatible with some of Alliance's other business-critical platforms and databases, preventing teams from seamlessly transferring field data to other systems or compiling all relevant data without a great deal of extra work. 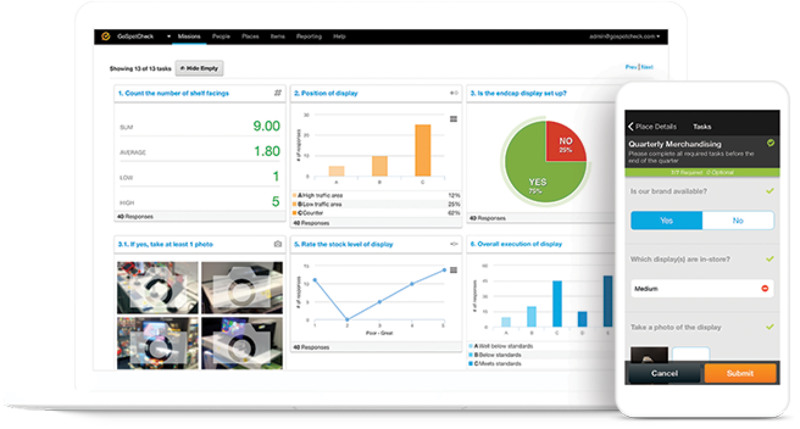 Finally, administrators struggled to achieve complete visibility into field operations as a result of the application’s lack of user-friendly interfaces and dashboards. They often found themselves asking other team members for help retrieving field documents and images or generating analytics reports. Ruper and Adamsen knew that any software upgrade needed to address current pain points and be intuitive enough so any employee could effortlessly add it to their current workflow. GoSpotCheck more than fit the bill. Both field teams and office-based administrators agree that GoSpotCheck’s interface has been incredibly easy to use, leading to widespread adoption across the organization. Any concerns about having a fractured reporting system with various personnel using different platforms have been comprehensively addressed. Alliance employees are more empowered than ever to analyze field reports and extract useful data. GoSpotCheck’s filtering capabilities—to sift through collected data—enable administrators to quickly comb reports and find specific information. In this way, GoSpotCheck helps remove reporting bottlenecks and pave the way for data to be efficiently gathered, disseminated, and leveraged. Implementing GoSpotCheck has also paid off for field team managers. The mobile platform makes it easier than ever to keep tabs on frontline employees and check which stores they visit. Not only does this keep field teams on task, but it helps Alliance accurately track which locations have been visited and which require attention. Since adopting GoSpotCheck, Alliance Sales & Marketing has witnessed a number of benefits in various corners of the organization. 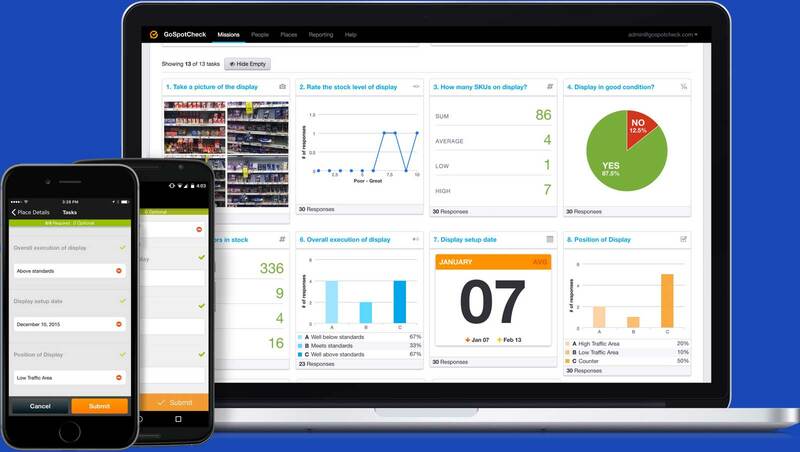 Retail teams use the mobile execution platform to monitor sales and promotions at the store level and document the success or failure of different marketing strategies. The introduction of intuitive image-capturing tools allows frontline employees to verify that listed prices are both accurate and reflect current promotions. Field teams are also able to use GoSpotCheck to diligently check that shelves remain stocked and that any display gaps are quickly addressed. Having this level of insight into store conditions enables Alliance to confirm that sales, promotional, and marketing strategies are executed correctly at the ground level. Field teams also use GoSpotCheck to monitor inventory changes and proactively flag out-of-stock items with distributors and manufacturers, keeping in-demand products on the shelves and filling voids. GoSpotCheck has brought about profound increases in both productivity and efficiency. Because the mobile platform allows for lightning-fast data entry and dissemination, Alliance’s team spends less time filing reports in the field than with the previous platform. ‍In fact, Alliance has effectively cut the amount of time needed to load information in half. It used to take upwards of 24 hours for field reports to populate in databases. The GoSpotCheck team has provided exceptional support services throughout the process, offering incredible assistance whenever needed.